Located at the distance of 11 km from Ajmer on the edge of the desert, Pushkar is a tiny tranquil town in the state of Rajasthan along the bank of the picturesque Pushkar Lake an important pilgrimage spot for the Hindus. Pushkar is one of the five holy dhams, pilgrimage centres for pious Hindus. It is also called Thirth Raj (the king of pilgrimage centres). 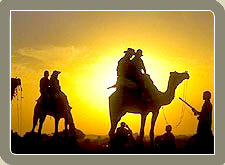 Today Pushkar is a popular tourist destination for foreign tourists as well as domestic tourists. Pushkar is one of the oldest places of India. According to legend, Lord Brahma created this place. Pushkar is the a bode of Lord Brahma, lying to its west with a temple and a picturesque lake. The Pushkar Lake is a sacred spot for Hindus. The coast of the lake has five main temples, many smaller temples and 52 ghats where pilgrims go down to the lake to take holy dip in the sacred water. During the month of Kartik (Oct./Nov. ), devotes throng in large numbershere to take a dip in the sacred lake. The lake has a mythological significance related with it. According to legend, Lord Brahma was on his way to search for a suitable place to perform a "Yagna' (a fire sacrifice) while contemplating, a lotus fell from his hand on the earth and water sprouted from three place. One of them was Pushkar where Lord Brahma performed his yagna. The Ramayana describes Pushkar and says that Vishwamitra performed Tapa here. It further says that Apsara Menka came to Pushkar to take a holy dip in its holy water. Although a serene town, Pushkar bustles with life during the joyous celebration held on Kartik Purnima. A huge and colourful cattle fair-the Pushkar fair, is also held during the time of Kartik Purnima. Dance music and colourful shops spring up during this fair. Also on sale are mouth-watering traditional delicacies. Colourfully attired village folk enhance the fun of the occasion. A host of cultural event against the backdrop of this pretty setting are also organised including attractive puppet shows. Cattle auction and camel races are also a part of the festivities. By Road : Pushkar is well connected by road. By Train : Nearest Railway Station Ajmer.